What's the story everyone's talking about? It's the one that's outsold the Harry Potter books, that's beating all records. The one that's disappearing off bookshop shelves faster than I can write this blog post. Well, it's not the one I'm going to write about. Why would I want to read a rambling story about abuse? Actually, to save me having to do it, and if you want a bit of a run down on it, take a look at this video. There. Now you don't have to read it, do you? I won't give a critique just at the moment, but just let me say it's one of those rare books I don't ever want to end, not even to find out how it all works out. To quote from the book, "the finest pleasures are always the unexpected ones"and, although I was looking forward to reading it, I didn't realize just how much it would appeal to me. The sense of magic that permeates every page has me, along with the characters, transported into a dream I never want to wake from. Enough said? Susan, thanks so much for visiting my site today! I hope you'll follow Kim. She has great content and insight. Thank you Susan! - I do follow Kim and I love her posts. Despite the het romancey aspect of it, this looks very intriguing. I might give it a go. It's not all that romancey - not yet, anyway. Haven't read Night Circus yet. I think you'll enjoy the magic aspect, Alex and it is very well written. Glad you're not going to read the other one, L.G.! Hadn't really heard of that one. The 50 Shades of Grey thing is so annoying. It boggles my mind sometimes how things that are so mediocre can become so popular. I agree PT. Amazing. Thanks Joe! 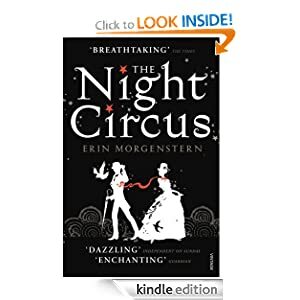 I've heard nothing but bad things about that book, however I keep hearing good about Night Circus. I'll have to check it out. Enough said indeed. I shall have to get a copy. I'm I intrigued. Good lord, Nick - it's amazing! Hope you enjoy NC. I admit that I've read Fifty Shades. Of course I had to see what all the buzz was about. Now I know I could have just watched a video. lol. I haven't read The Night Circus.